DALLAS, TX — Landmark Theatres today announced the grand opening of its newest Living Room Auditorium at Dallas' Classic Inwood Theatre. 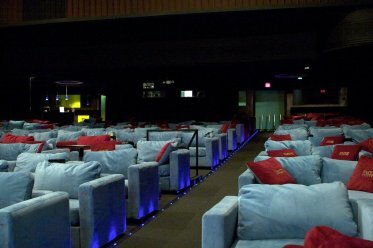 This unique auditorium — the first and only one of its kind in Texas — will give audiences an unparalleled movie-going experience just in time for summer’s most anticipated film, “Indiana Jones and the Kingdom of the Crystal Skull,” which opens at the Inwood on May 22 at 12:01am with a special midnight show. Working in partnership with the LoveSac Furniture Company, Landmark completely re-invented the first-floor auditorium of the Inwood with a variety of unique seating options including couches, loveseats, chairs and ottomans, as well as the original LoveSac. A private bar also was added, allowing patrons to purchase cocktails and soft drinks without ever leaving the auditorium. Landmark Theatres first introduced the Living Room auditoriums in their Los Angeles flagship theatre, The Landmark, where they won widespread acclaim from audiences. The much-loved Inwood Lounge, Dallas' best martini bar, was also incorporated into the theatre, allowing patrons to take their drinks with them into the auditoriums. With this new renovation, guests will be able to enjoy their drinks in the plush Living Room™ Auditorium, as well as the upstairs auditoriums, which will retain their stadium-style leather lounge seating. Landmark consistently strives to deliver the best and most innovative amenities to compliment the terrific films they showcase. Landmark Theatres is the nation’s largest theatre chain dedicated to exhibiting and marketing independent film. Landmark is a recognized leader in the industry for providing consistently diverse and entertaining film product in a sophisticated adult-oriented atmosphere to its customers. Since its inception in 1974, Landmark Theatres has grown to 57 theatres in 24 markets. Landmark is known for both its award-winning historic theatres, such as the Tivoli in St. Louis, the Inwood in Dallas and the Oriental in Milwaukee, and its more contemporary theatres, including the Sunshine Cinema in New York City, the Bethesda Row Cinema in Washington, D.C., and the Keystone Art Cinema in Indianapolis. In the last year, Landmark Theatres embarked on of a record period of growth that spanned the country. They opened three brand new theatres and added three others on the East Coast and one in Ohio. Landmark entered the Philadelphia market in March 2007 by acquiring the famed Ritz Theatre circuit. Then, in June, the company unveiled its flagship theatre, The Landmark, in Los Angeles. In November, Landmark opened Landmark Theatres Harbor East in Baltimore’s vibrant Inner Harbor. And, in December, the Landmark Theatre Greenwood Village debuted in Denver’s flourishing Tech Center. Most recently, Landmark Theatres assumed operation of the Gateway Theatre in Columbus, a state-of-the-art theatre with seven movie auditoriums. Landmark is at the forefront of exhibition, providing customers with a number of amenities including the latest in film, digital and sound technology, the widest selection of concession items, in-theatre sales of DVDs, books and CDs as well as Landmark’s signature brand of customer service. Landmark Theatres is part of the Wagner/Cuban Companies, a vertically integrated group of media properties co-owned by Todd Wagner and Mark Cuban that also includes theatrical and home entertainment distribution company Magnolia Pictures, production company 2929 Productions, and high definition cable networks HDNet and HDNet Movies. Shouldn’t there be a disclaimer saying “Advertisement”, like they have in the newspaper? Very cool! Just a hair under the Alamo Drafthouse’s coolness, but I could definitely enjoy a movie in couchy comfiness. That “living room” is WAY WAY bigger than the ones here in LA. Maybe they’ll convert an existing aud to another “living room”. The Cable Car Cinema in Providence has featured couch-seating since 1975. This place, however, appears to be a tad more elegant. Looks very comfy but the maintenance and clean up has to be a pain.